Some books are dessert. They’re not chocked full of nutrition for your brain, but they’re a nice change of pace sometimes. I don’t read dessert books a whole lot (I think each person may have his or her own definition of dessert). 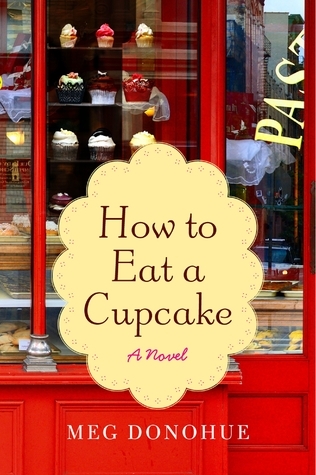 When I picked up How to Eat a Cupcake, I didn’t expect to like it. But I had a stack of ten books I’d gathered so far at the library and not one of them seemed at all promising. I started reading How to Eat a Cupcake on Saturday night when everyone else in my house was fast asleep and I was wide awake but wanting to be asleep. “This should do the trick,” I thought. I was wrong. I finished it the next day. It was not dinner, but I still kind of liked it. It was refreshing, in a way. Kind of like hanging out with an old friend watching old movies and drinking chocolate milk. The friendship between Julia and Annie is complex. The story is told in turns by these two characters, which I think was a a great way to write the book. Readers can see what’s going on in the thoughts of the two main characters. Annie’s character was a little on the annoying side at times, but for the most part, it was easy to like the characters you were supposed to like. Donohue did a good job of introducing Julia as a society type you’d roll your eyes at and dismiss, or even loath, and then transforming her as you read and get to really know her. I didn’t enjoy the romance part of the book at all. It was very shallow. But it’s easy to skip over most of that. One of the best parts of the book was how it treated a certain grief many women have but don’t know how to deal with, or how to even talk about it. I won’t give it away, but it’s really a surprisingly insightful look into an issue that just doesn’t get talked about a whole lot, and I think it should. Still, pick this book up only if you’re in the mood for a chick flick but would rather read a book than watch a movie. Or you feel like a very light read at the pool. Or you love this kind of book in general and don’t know why I’m making a huge deal over it. Forgive me. I’m still trying to get over my hang up about admitting that I like some books. I’m also trying to get over a craving for cupcakes. I highly recommend buying the ingredients for cupcakes before reading this book. Next on my to read list is Life After Life by Kate Atkinson. There’s a lot of buzz about this book, which makes me nervous to read it. I’m looking forward to it, though.